When planning a blog post, choosing the right keywords can make the difference between search engine success and failure. You can write the best post in the world but, if 800 people have written on the same topic already, you may struggle to see any decent returns on your investment. Perhaps you have an idea for a blog post but need to choose an angle to write about. Or maybe you’ve chosen a topic but you want to make sure you are using the precise phrases your audience is searching for. Keyword research can help you to identify the best words and phrases to target and there are tools available that make it easy to find keyword combinations to employ. In this post, we will go through four free, keyword-research tools that can help you with your content preparation and planning. KWFinder helps users to find long-tail keyword recommendations, while providing in-depth information about search volume and competition. KWFinder also lists the top ten Google results for the word or phrase you are investigating. To start, you input the words you are interested in and choose the country and language you want to research. You are then presented with detailed information about the word or phrase you have searched for, as well as related keywords. 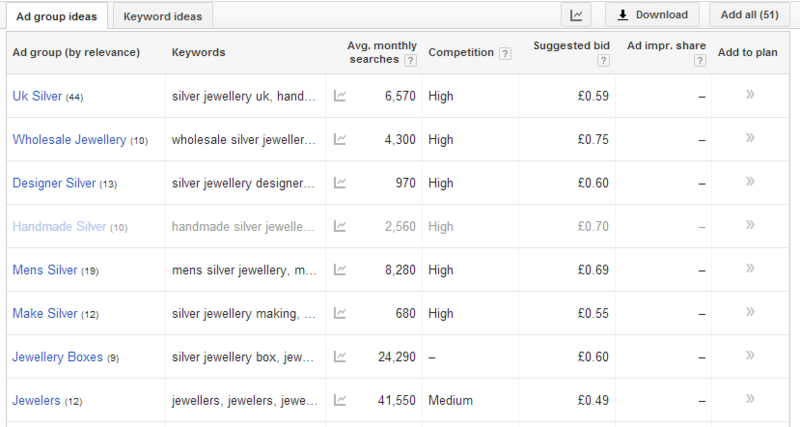 You can click on any suggested keyword on the left-hand side of the screen to see the stats related to that word. KWFinder presents complex information in an easily accessible way. The metrics the tool displays are detailed and easy to understand, and even the free version of KWFinder offers a lot of data that is incredibly useful for researching and planning website content. WordStream is a paid keyword tool that offers limited functionality to users for free. 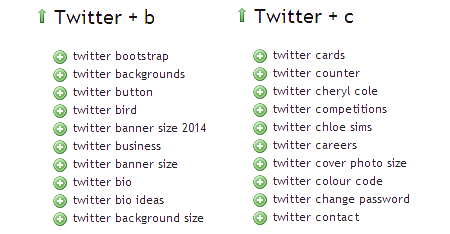 When you search for a word or phrase, WordStream displays keyword suggestions from its database. You will also see information on how frequently the suggested words and phrases are searched for, relative to the terms you inputted. For paid users, WordStream’s tool provides information on search volume and competition but, for free users, relative search volume is the only metric that is visible. However, the keyword combinations WordStream suggests are still useful for content planning. Free users can carry out up to 30 WordStream searches per day. WordStream’s search results can be downloaded as a .CSV file when the user inputs an email address below the search results. 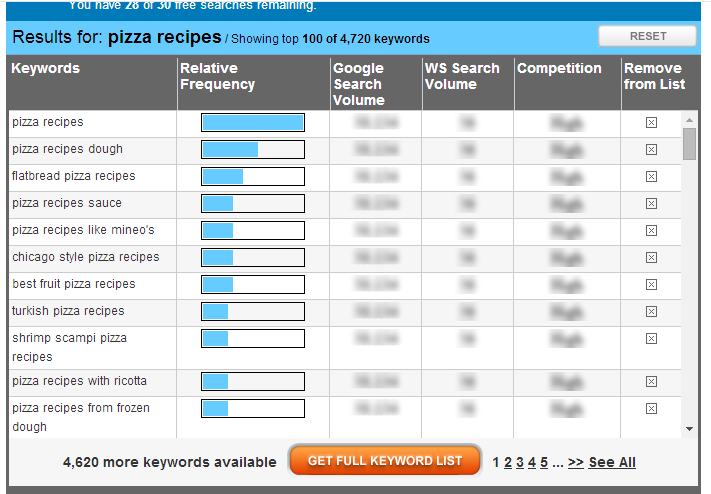 If you are just looking for keyword suggestions, WordStream can be a useful tool. However, many of the most useful metrics are blurred out for free users so, if you are looking for something more comprehensive, WordStream may not be the most suitable option. Übersuggest is a simple tool that instantly generates hundreds of keyword suggestions. When a keyword is entered into the search box, Übersuggest provides a list of the top ten words and phrases that begin with each letter of the alphabet. Users can click the + sign next to each word to add it to a shortlist. Next, click ‘Get’, and a list of the words that have been selected can be easily copied and pasted into a text document or spreadsheet. Übersuggest offers a plethora of keyword ideas to choose from and no registration is required. This tool is great for idea generation but it does not prioritise the results by displaying search volume or competition levels. The Google AdWords Keyword Planner provides keyword suggestions, the estimated search volume for the words and phrases you search for, and a cost-per-click amount for AdWords ads. 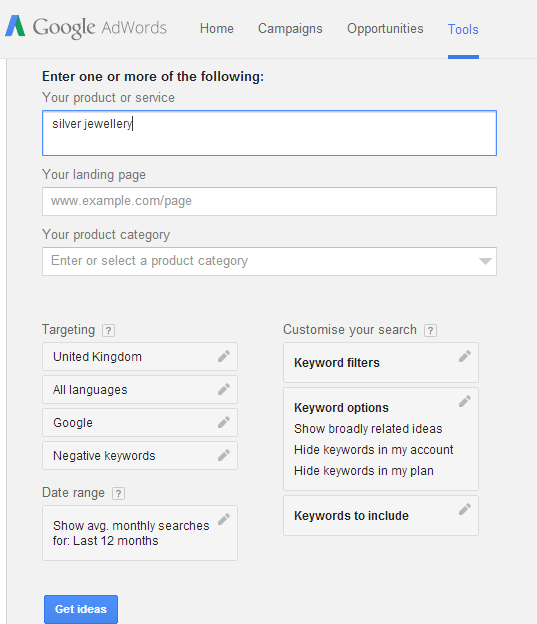 To use the Google Keyword Planner, go to https://adwords.google.com/KeywordPlanner and click “Search for new keyword and ad group ideas” on the left-hand side of the page. 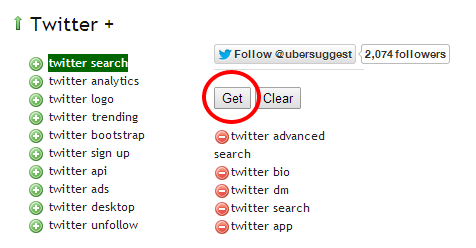 Enter the key words and phrases you want to focus on, choose any targeting options you want (e.g. country and language) and click “Get ideas”. 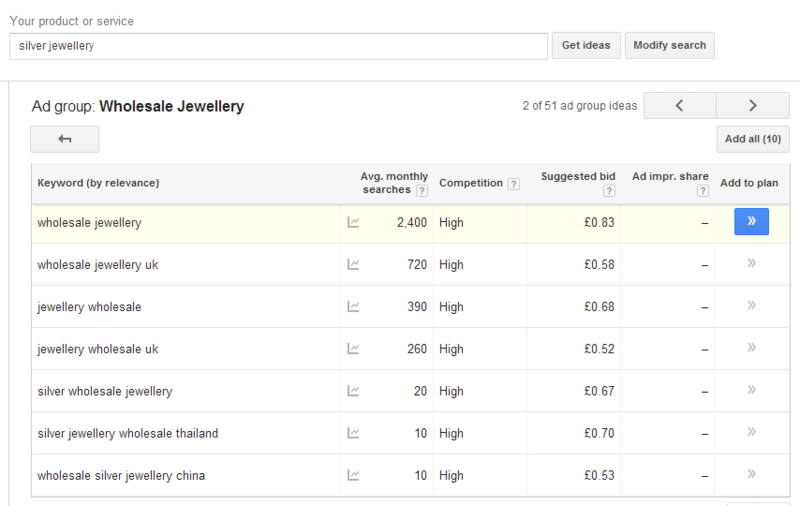 The Google Keyword Planner will display keywords divided into groups; in this case, different categories for “silver jewellery”. Let’s say the search for silver jewellery is research for a website that sells wholesale jewellery; you would click on that group to get more detailed results. You can also move back and forward between other ad-group combinations, and you can edit and amend the search terms at any stage. This tool is useful but it is not very user-friendly for beginners. Alternatives, like KWFinder, offer similar information in a much more accessible way. The best tool for the job depends on the information you are looking for. If you are short of topic ideas and simply need a long list of suggestions, Übersuggest or WordStream will provide keyword combinations to inspire you. If, on the other hand, you want detailed metrics about search volume, competition and search patterns over time, KWFinder or the Google AdWords Keyword Planner are far more suitable and will give you the data you need. If you have any questions about the tools mentioned in this post, please drop us a comment below and we’ll get back to you. Be sure to let us know if we missed your favourite tool.